The efficiency of the national innovation system in Russia is the key issue in the transition from a resource-based to a knowledge-based economy. The President’s programme of technological modernisation of industries announced in 2010 envisages a set of systemic policy measures aimed at bridging the gaps between key stakeholders, i.e. business, R&D institutions, universities and government. S&T foresight is considered as one of the key instruments to identify national S&T priorities and formulate a long-term perspective for S&T development and innovation in Russia. The Russian national innovation system (NIS) has been facing problems hampering the transfer of R&D results to the real economy. Despite increasing public R&D funding, the output measured in the number of international publications and their citation, the innovation activities of industrial enterprises and the technology balance of payment have been deteriorating. The share of non-budgetary R&D funding in Russia is much less compared to more developed countries, network communications between major NIS stakeholders are underdeveloped and business participation in the formulation of the national R&D agenda is very limited. All this results in a rather low level of R&D investment performance. In recent years, the Russian government has undertaken a number of initiatives aimed at increasing NIS efficiency, and foresight methods are considered as one of the key tools for orienting the technological modernisation of the national economy. The crisis of 2008-2009 has sensitised the Russian business community to issues concerning the longer-term prospects of the future development. In this environment, the broad discussion of foresight results has triggered a burst of interest in forward-looking activities in Russia – both at the government level and in many large companies. Government and business representatives have started to perceive foresight exercises as a practical instrument for setting strategic goals and discovering alternative pathways to achieve them. 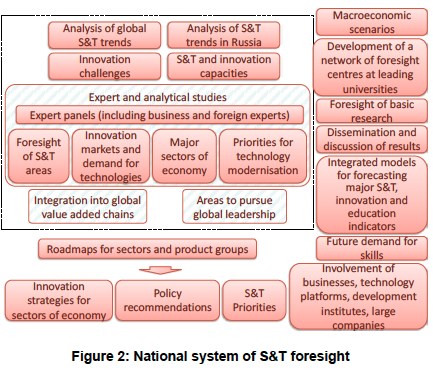 All of the above-mentioned initiatives to a greater or lesser extent are based on the results of previous nation-wide foresight exercises, including the two cycles of selecting national S&T priorities and critical technologies in 2006 and 2011 as well as the large-scale S&T foresight projects covering all major areas of research, including a national S&T Delphi survey and the recent study of prospective S&T clusters promising the highest social and economic return. 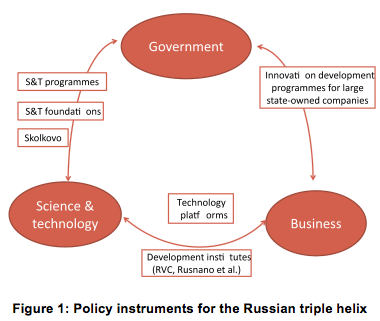 The post-crisis realities highlighted a need for more detailed analyses of prospective S&T studies with particular attention to be paid to the practical orientation of the national S&T system and bridging the gap between the major components of the Russian triple helix: S&T, business and the government (Figure 1). Technological modernisation is one of the most important issues on the political agenda in Russia today. That is why the federal authorities responsible for innovation development have initiated a system of activities to facilitate innovation processes in industries and bridge the gaps between research institutions, universities and businesses. The key actors in this process are the Government Commission on High-Technology and Innovation, the Ministry of Education and Science of the Russian Federation and the Ministry of Economic Development of the Russian Federation. In 2006, the Russian president approved two lists of eight S&T priorities and 34 critical technologies, respectively, based on which R&D funding was distributed among the government’s major S&T related programmes. In 2009, the Ministry of Education and Science initiated a process of revising national critical technologies, as part of the regular revision of the national S&T priorities, employing the methodological approaches developed in 2008. Compared to the 2006 lists, the revised ones could draw on a much broader basis: the National S&T Delphi allowed to identify the future demand for goods and services to be supported by technological development. In addition, experts analysed the national system of social and economic goals, which were formulated in the Concept of the National Socio-economic Development 2020 as well as in a number of other major strategic documents of the Russian Federation. The major government bodies, state academies of sciences and largest state-owned corporations submitted their proposals for revising the national S&T priorities and critical technologies, which were analysed in expert groups composed of leading Russian researchers, industrialists and government officials. The revised list of critical technologies consists of 25 items. A detailed “passport” was developed for each one containing a brief description of the particular technology, the subject area, the areas of practical application, level of development in Russia compared with the world leaders in the field, production capacities, and an assessment of the global and national markets for innovative products and services related to the technology in question. The main instrument for the practical implementation of the S&T priorities and critical technologies is the Federal Goal-oriented Programme “R&D in Priority Fields of the S&T Complex of Russia (2007-2013)”, which is complemented by other federal programmes of this kind, such as the “Federal Space Programme in Russia (2006-2015)”, “Programme for Civil Aviation (2002-2015)”, “National Technological Base (2007-2011)” as well as by a number of sectoral and regional programmes. Resources required to achieve competitive status in particular clusters, including personnel, R&D expenditure, fixed assets etc. The main output of the S&T foresight study was to identify the most important trends of S&T development by 2030 as well as emerging and rapidly growing S&T areas. Analysis of the future prospects of the most promising innovative clusters allowed pinpointing those segments of the high-technology markets where Russia can expect to successfully strengthen its competitive advantages. The participants developed pilot technology roadmaps for two of those clusters (“Catalysts for socially oriented applications” and “Tissue engineering and bioartificial organs”). The roadmaps included demonstration procedures for building a long-term vision and identifying alternative trajectories to achieve the roadmap objectives. The foresight results led to proposing a number of large-scale innovation projects to be funded as part of public-private partnership programmes, allowed identifying key areas of research to be financed by the Federal Goal-oriented Programme “R&D in Priority Fields of the S&T Complex of Russia (2007-2013)”, provided a basis for formulating measures to build S&T capacities (funding, human resources, etc.) and for analysing potential S&T policy instruments to be introduced. In the key areas singled out, S&T policy intervention focused on restructuring the public R&D sector, introducing mechanisms to evaluate research, monitoring and evaluating S&T and innovation policy implementation, elaborating efficient, result-oriented mechanisms of R&D funding, including planning of basic research, and building institutions to support R&D and innovation. Based on the results of the last five years, the Ministry of Education and Science has developed a framework for the next round of S&T foresight to be implemented in 2011-2013. This cycle will cover a wide range of activities aimed at increasing innovation activities in Russia and concentrating resources on the most promising S&T areas with respect to particular market segments and innovative products and services. The foresight will cover all areas of S&T and a number of sectors where new technologies can be expected to have the greatest effect (Figure 2). The major principles of the emerging foresight system include integrating foresight into the S&T policy agenda and equipping policy-makers with practical instruments to facilitate innovation development in Russia. In other words, the new system should follow the fully-fledged foresight approach. The methodological basis for the above-mentioned activities will include a wide range of qualitative and quantitative methods: horizon scanning, bibliometric and patent analysis, statistical models, expert surveys, literature reviews and many others. It will be important not only to identify the key challenges facing the Russian national innovation system but also to assess global trends of S&T development and, if necessary, to revise the national S&T and innovation capacities to promote the technological modernisation of the Russian economy. The foresight activities will also cover the two principal instruments initiated by the Government Commission on High-Technology and Innovation: creation of technology platforms and elaboration of “compulsory” programmes for innovation in large companies fully or partly owned by the state. The main goal of these initiatives is encouraging business to innovate and bridge the gaps between industrial enterprises, research units and universities. It is supposed that facilitating the dialog between S&T and businesses will lead to closer cooperation and the formulation of a national research agenda better tailored to the real needs of the economy. Each technology platform is required to develop a set of strategic documents, including a technology roadmap and a research agenda, and is expected to incorporate foresight results in the process. These strategic documents will provide the basis for adjusting the national R&D effort to the needs of businesses and will be used for identifying promising research projects, which are to be funded through federal programmes and supported through innovation-oriented public procurement practices. The list of 28 technology platforms has been approved by the Governmental Commission on High-Technology and Innovation. The innovation programmes that the largest state-owned companies are required to develop also envisage foresight-related activities. The companies’ programmes are supposed to represent a corporate vision of innovation activities with a ten-year horizon. The ambitious goal is to increase competitiveness in local and global markets and improve economic performance according to key indicators within this time frame by means of technological modernisation and radically increasing R&D efforts (e.g., via closer collaboration with universities and other R&D organisations in particular). The newly designed S&T and innovation policy instruments in Russia include foresight tools as an integral part of their approach. The largest state-owned companies are required to include foresight activities into their programmes of innovation. Every technology platform has to develop a vision and a roadmap indicating the main technology-related milestones, barriers and risks. The Skolkovo Foundation has initiated foresight studies aimed at identifying key technology areas to be supported. Leading Russian technical universities have established a network of foresight centres to build new capacities. This process is supported through the federal programme for the development of universities’ innovation infrastructure. The network will also monitor technology trends in particular areas and support a more systemic involvement of private businesses in foresight studies, thus bridging the gap between key NIS stakeholders.